This set of instructions on how to make a Rokkaku kite assumes you know absolutely nothing about kite making. You might already have some of the simple tools and materials required. The MBK Dowel Rokkaku is a fairly large tail-less design based on the traditional Japanese kite. However, it will still fit into nearly all road vehicles, ready to fly. Either just in front of the rear seat, or flat in the trunk (boot). Like the other Japanese design in this series, the Sode, this kite is a light to moderate wind flier. Setting up on the flying field is just a matter of attaching the bow-line toggles to put some curvature into both the horizontal spars. Then the flying line is attached to the bridle. At this point you are ready to launch! The method of attachment is illustrated further down this page. 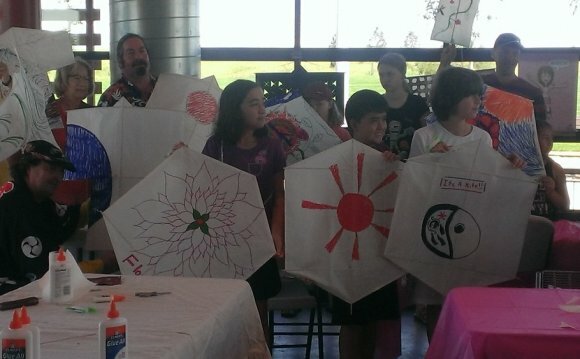 Some like to make Dowel kites like this one in Tyvek. OK, so these designs can fly tail-less - but adding extra stability or just creating a visual face-lift is still worth considering! Now's the time to read up on the required for making a Dowel Rokkaku, if you haven't already. For this kite, you will also need some cheap thin shoe-laces. Note: In order to fit the length of an 80 liter garden bag, I made this design shorter than a traditional 4:5:6 Rok of the same wing-span. You see, I'm trying to standardize on a 1.2 meter wingspan for all the Dowel kites!